Deciding which cabin to select for a cruise can be difficult. For our quick getaway on Mariner of the Seas, we opted for a guaranteed balcony and ended up with a “Spacious Balcony” Cabin on Deck 10. 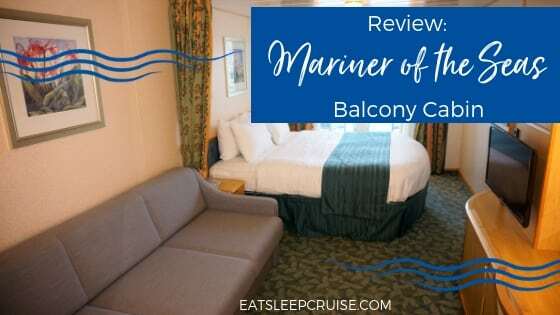 For cruisers comparing different options on the ship, we have put together this Mariner of the Seas Balcony Cabin Review. For this cruise, we redeemed our credit card reward points for a “free cruise”. This redemption gives you a credit towards the purchase of an oceanview or better stateroom on the ship. We booked this cruise less than 30 days prior to sailing, so the best option for us was a guaranteed balcony room. This ended up costing less than $150 a person, as you always have to pay the taxes and fees when using the reward points. A few days later, we were notified that we were assigned to cabin 1362. 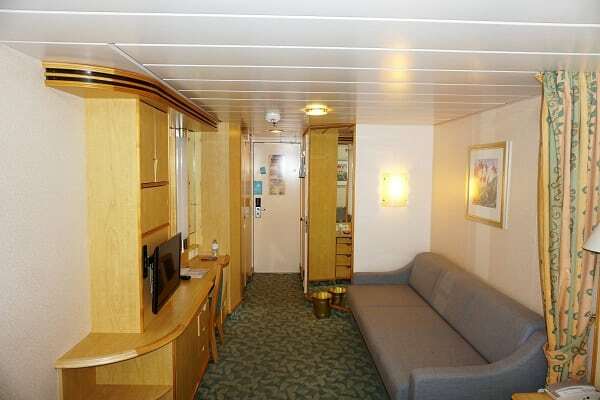 This starboard side cabin on deck 10 is considered a Spacious Balcony stateroom. According to the online deck plans, the room has a total square footage of 203 square feet. The balcony itself is listed has having a total area of 42 square feet. 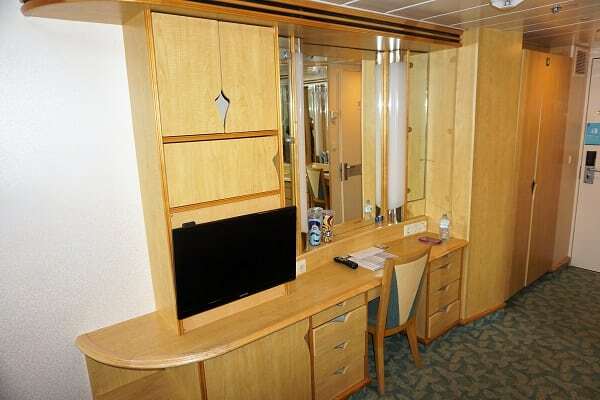 This stateroom had a very typical setup for Royal Caribbean to which we have grown accustomed. Even though the ship just went through a $120 million renovation, it is clear that the cruise line spent little on updating the staterooms. 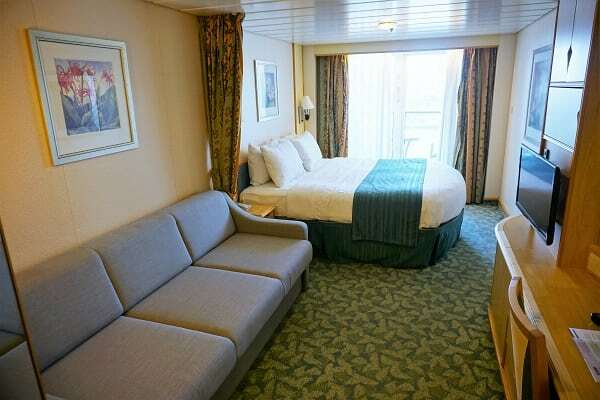 Our spacious balcony cabin’s decor was still the color scheme found on older Royal Caribbean ships. Even though the cabin didn’t win any awards for the prettiest stateroom, it was an efficient and easy to maneuver layout for a quick getaway. When you first enter the room, the bathroom was to the left of the door. It was the typical small bathroom found on most cruise ships. There was a cylinder-shaped shower with a sliding door and a strategically designed sink and toilet area. Passing the bathroom was a small sitting area with a couch. This space often becomes our storage area during the cruise. We did also use magnetic hooks to hang things like beach bags and hats over the couch for extra storage and convenience. The closet was located across from the bathroom, on the right-hand side when entering the room. For three days, it was large enough to hold all our clothes between the hangers and several shelves off to one side. In front of the couch was the usual desk area with a large mirror and plenty of cabinet space. The desk is always multi-purpose, especially now with the blog. We use it as a charging area, blogging station, and a spot for the Princess to get ready. Off to the side of the desk was a small flat screen television. You can position the TV mount so that it is viewable from either the bed or the couch. Below the television, there is also a small refrigerator that we used to store extra bottles of water. The bed set up in this cabin category was located directly in front of the balcony. We are not all that picky when it comes to the bedding, but it was more than comfortable for us during the cruise. After the long days and nights on Mariner of the Seas, we had no trouble falling asleep! As for the balcony, we did not spend much time out there on this short cruise. However, it was a decent size to enjoy some morning air while sipping coffee and to snap some photos along the way. While the cabin is considered “spacious”, we did not notice any appreciable difference in the size of this cabin when compared to other balcony cabins. We felt the room was an adequate size for a couple. According to the deck plans, this room category can hold up to four guests. A family of four with young children would probably be able to manage for a short weekend cruise. If you are traveling with four adults or teenagers, the cabin might feel a bit tight. The room layout was manageable with adequate storage available. Though, it would have been nice to see some new upgrades to the rooms. For instance, some new decor or additional outlets and USB ports could have been added during the drydock. Having sailed in a variety of cabins from inside rooms to junior suites, we were more than satisfied with this room. Booking the guaranteed rate was a good deal as we ended up with an ideal room and location. When we head back for Perfect Day CocoCay next year, we will probably book a similar cabin. 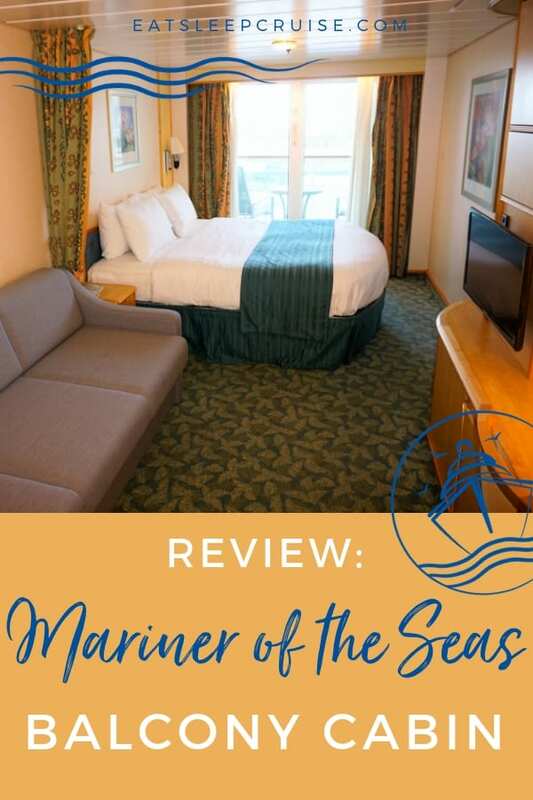 Have you stayed in a balcony cabin on Mariner of the Seas? 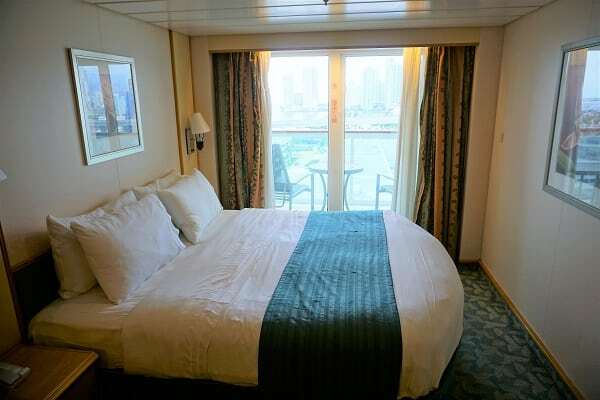 What type of cabin do you normally book when taking a cruise? Drop us an anchor below with your Royal Caribbean stateroom reviews.